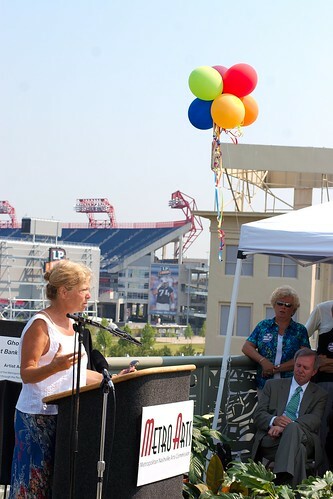 I stopped by the dedication for the Ghost Ballet yesterday up on the Shelby St. Bridge. There was a quartet of symphony players making sweet music for everyone, free water and popsicles. Various accolades and thanks were given, to a remarkable extent (I’ve never clapped so much in my life). Mayor Purcell spoke, and I thought it was actually a pretty good speech considering it was a one-off little dedication that he could have blown off with some banal rhetoric and went on his way. Then we heard from the woman of the hour herself: Alice Aycock, the artist behind the Ghost Ballet. She spoke about her motivations behind making the piece and how she tried to connect it to Nashville’s past and future. She spoke for quite a while, actually. A pretty long time. A good long while. I couldn’t resist posting the picture (above) of Purcell checking his watch towards the end of her speech. She even addressed the sentiment that it looks like a roller coaster. “Of course it does,” she said. She grew up near Hershey Park in PA. Alrighty then. But then where does the name “Ghost Ballet” come from? Shouldn’t it be called the Ghost Coaster or something? Screaming Demon? No? Tourist #1: Wow, music city! Tourist #2: I know! Check it out! The country music hall of fame! Tourist #2: Sweet, lower broad! There’s tootsie’s!! Tourist #1: Holy crap, they even have a roller coaster!! Best city ever!! You can imagine where it goes from here. Disappointment, dejection. I dunno. Could be dangerous. She could have at least lied and said it look like a roller coaster in reference to the old Opryland theme park. Who cares that she grew up in Hershey, PA? That doesn’t mean she has to build an abstract coaster on the Cumberland River. I will say though, i just googled her and we could have had worse. She’s proposed some real gems for a project in Miami. Best thing about this post? Purcell checking his watch in the picture. Okay, so that picture is hilarious. I would tend to think that after it’s been sitting there for a while, people will either grow accustomed to it or even perhaps warm up to it. And then I remember this idea someone had here in Virginia a while ago to build a park with cement casts of all the presidents’ heads, which garnered a similar public reaction in our area. And yeah, everyone still hates it. You can imagine where it goes from here. Disappointment, dejection. Forty years of darkness. Earthquakes, volcanoes, the dead rising from the grave, human sacrifice, dogs and cats living together – mass hysteria. I saw it today… God, it’s ugly. I want my tax dollars back.